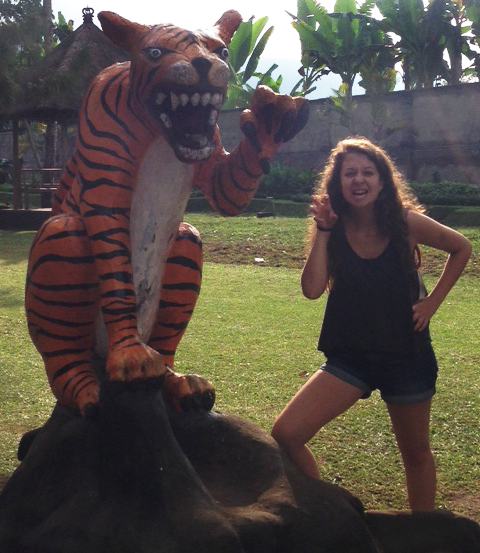 I’m always surprised when I see tourists getting up close and personal with “wild” animals. In Costa Rica, I remember a woman feeding an iguana bits of her bread. Bits that is, until another iguana launched itself from a tree branch into her lap and took the whole sandwich. 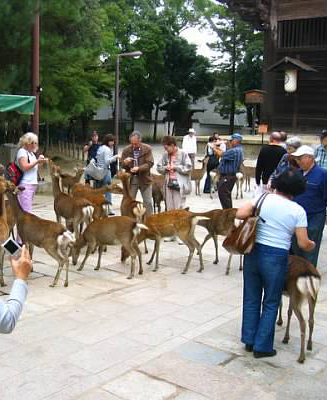 The deer in Nara, Japan are also a hit with the tourist crowd. Thousands of these animals, sacred to the residents of Nara, roam the streets, eating as much as tourists are willing to feed them with special food purchased from carts and vending machines. It was cute at first, but when I saw aggressive deer nipping at tourists hands, and trying to eat their purses and bags, the cute factor was replaced by the fear factor. And don’t get me started on the deer poop. Let’s just say, like the thousands of deer, the poop was also prolific. On our recent trip to Bali, we ventured through the Sacred Monkey Forest Sanctuary of Ubud. 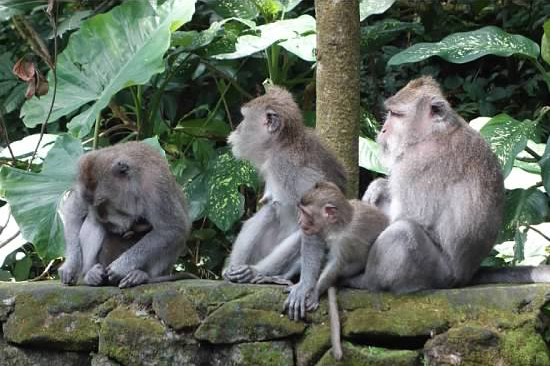 More than 500 Balinese long tailed Macaques (monkeys) live in the Sanctuary, and as stunning as the temples inside the Forest are, most tourists seemed preoccupied with taking photos of the monkeys and feeding them bananas. The Forest boasts Indiana Jones like temples and statues, surrounded by rope-like tree branches. I expected to see Harrison Ford (in his ahem, younger days) hurtling down at any moment. But these fantastic surroundings were lost to many tourists in the shuffle of trying to get up close and personal with the Macaques. Now it’s one thing to hand a banana to a monkey, or even an elephant, as we did once in Thailand. But, in my humble human opinion, it’s quite another thing to badger a monkey into shaking hands with you until it hisses and bears its teeth at you (witnessed in Ubud), or encourage monkeys to jump onto your traveling companion’s head so you can have a perfect photo opportunity (true story). Wild monkeys are just that – wild. It’s true that some may be desensitized and therefore gentler from spending so much time around humans. But I’m here to tell you, when they hiss and try to scratch you with lightning speed I’m reminded that they are referred to as wild for a reason. With the exception of my children, I’ll stick to appreciating wild animals from afar.